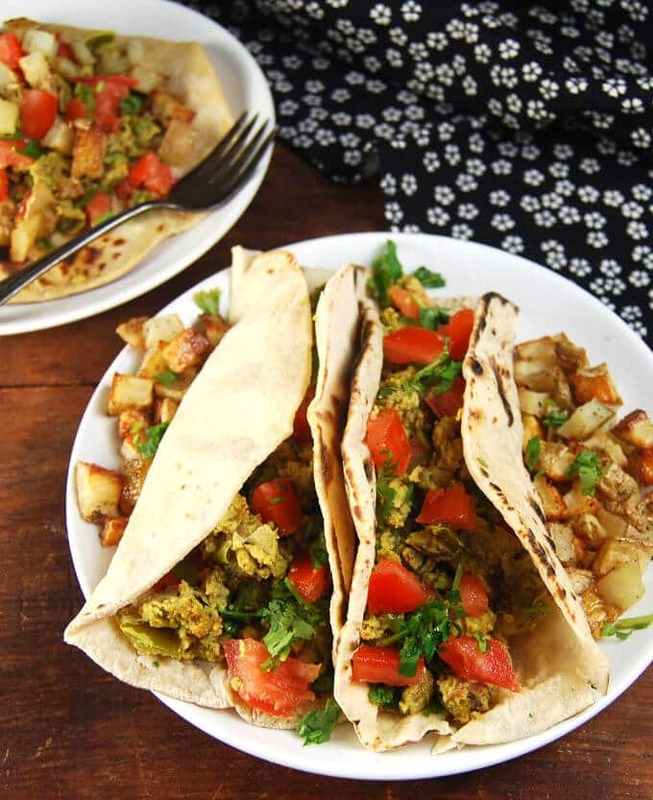 These scrambled chickpea eggs are eggless, of course. 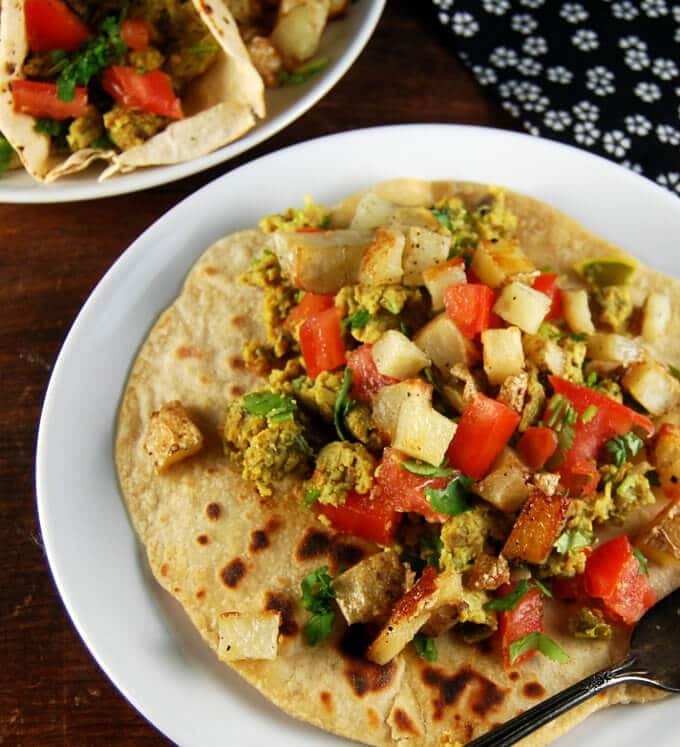 Tofu, scrambled with the chickpea flour, gives an extra protein boost, as well as keeps the “eggs” from drying out. 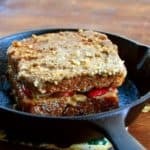 Add lots of veggies, like green peppers, tomatoes, and roasted potatoes, for more deliciousness at the breakfast table. Back when I ate eggs, the only kind of eggs I would eat, if I could help it, were scrambled. 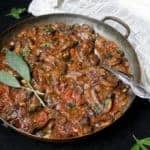 Scrambled with cream and butter and served on toast, or scrambled the Indian way, with spices and herbs and onions, and served with a chapati or roti. Both were delicious. After going vegan, I switched to scrambling tofu or scrambling chickpea flour, but neither really appealed to me. 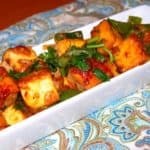 The tofu, no matter how many spices and herbs I added into the mix, was never quite flavorful enough and didn’t really lose that tofu taste. And the chickpea flour, although delicious, tended to become rather dry once cooked. And then, one day, I thought, why not marry the two? It couldn’t hurt. 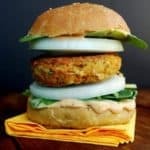 Chickpea flour and tofu are both rich in protein, and who doesn’t need a strong protein wallop at the start of the day? 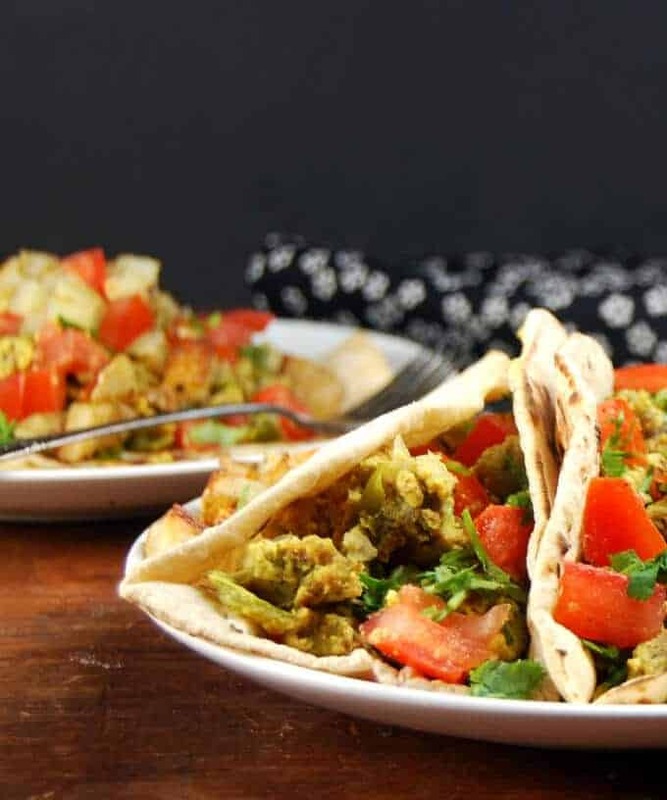 Sauteed with veggies, and served on a whole-wheat tortilla or chapati (or a gluten-free wrap, if you’d rather), it would be a rather perfect meal. Now, this is the only way both Desi and Jay will eat scrambled eggs. In fact, they prefer them over the real thing. For one, the tofu just disappears into the scrambled chickpea eggs, so if you have that someone at home or among your friends who will turn up their nose at tofu, this is the perfect way to get it into them and then gloat. Also, I find that the flavor of chickpea flour can sometimes overwhelm a dish, but here the tofu softens that considerably. I love throwing a ton of veggies into my scrambled chickpea eggs. Green peppers are the favorite, followed by scallions or spring onions, carrots sometimes, and baby spinach. I almost always serve it topped with a ton of tomatoes and some simple oven-roasted potatoes. I cut the potatoes in a really small dice, salt and pepper them, put them on a baking sheet sprayed with oil, spray the suckers again once they are on the sheet, and put them in a hot oven for 30-45 minutes, tossing them once around halfway through the roasting, with a spatula. Follow Holy Cow! 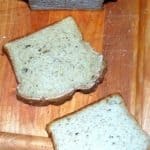 on Pinterest for more great recipes! Place the chickpea flour in a blender with the tofu and water. Blend into a very smooth paste. Set aside. Heat the oil and add half the coriander leaves and the onion. Season with some salt. Saute until the onions start to turn translucent, 3-5 minutes over medium heat. Add the cumin, turmeric, cayenne, grated ginger and green bell pepper. Saute for two more minutes, then add in the tofu-chickpea mixture from the blender. Allow it to stand for a minute or two, then begin to stir the tofu-chickpea mixture, just as you would stir scrambled eggs. This will take a little longer than it would take you to make eggs, because the water has to evaporate, but it will also help to cook the raw chickpea flour and make it delicious. Stir frequently for about 15 minutes or until all of the water has evaporated. As the water reduces, the mixture will look rather gloppy, but as you continue to cook it will get dryer, Keep scrambling it as much as possible with a spatula. Add more salt if needed before the mixture dries out completely. scrambled enough, wait a few minutes for the temperature to drop, then scramble them with the spatula. 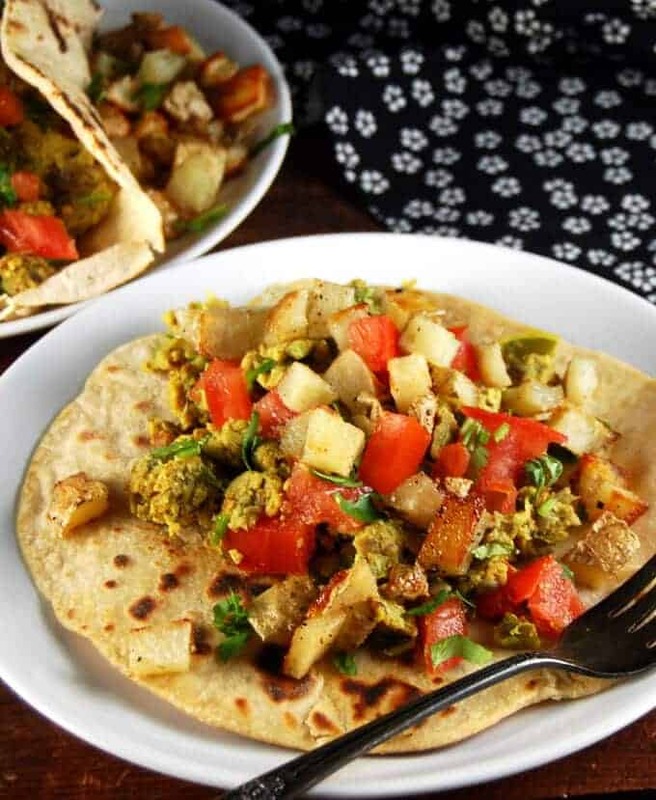 Sprinkle on the diced tomatoes and serve warm inside tortilla or chapati wraps. 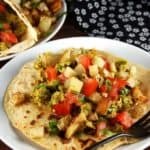 *Top the chickpea egg wraps with some diced, roasted potatoes. « The best vegan white pasta sauce. Ever. Hey Namrata, hope you try! 🙂 The tofu makes a world of difference. I don’t like to eat foods that mimic animal products…. it perpetuates the myth that somehow meat based recipes are tastier and more important than plant based dishes. 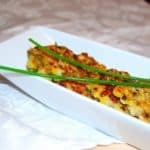 I love your recipe for chila [https://holycowvegan.net/eggless-vegetable-omelet-besan-chilla] and have even sent it to my animal rights colleagues as the real thing instead of an egg knock-off. 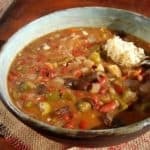 There is protein in legumes, so I don’t worry too much about not getting enough protein. My favorite breakfast with enough protein and carbs to get my day off to a good start is the dosa. The urad dal has plenty of protein. If you serve a masala dosa with potatoes you get the melatonin boost as well. Or you can serve the potatoes on the side as you have done for this recipe. 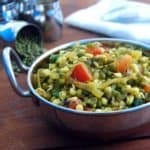 The Indian traditional vegetarian diet has more than enough protein and nutrients and best of all there are no faux meats. 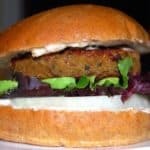 It is not centered around meat, and if you substitute oil for ghee it is easily made completely vegan. There is wisdom in this diet and I enjoy learning about it and can’t get enough of the real thing. Plus all the spice blends are so delicious. Hi Ruth, I love the chilla and the dosa too — both make a great breakfast. And there is certainly a lot of truth in your statement that Indian vegetarian meals are usually well balanced for protein. 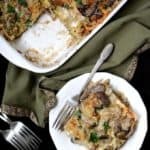 But frankly, I sometimes enjoy eating meatless versions of the meals I once made that were not vegan or vegetarian, and I am pretty certain there are many vegans who feel the same way.